The tidal force is an apparent force that stretches a body towards and away from the center of mass of another body due to a gradient (difference in strength) in gravitational field from the other body; it is responsible for diverse phenomena, including tides, tidal locking, breaking apart of celestial bodies and formation of ring systems within the Roche limit, and in extreme cases, spaghettification of objects. It arises because the gravitational field exerted on one body by another is not constant across its parts: the nearest side is attracted more strongly than the farthest side. It is this difference that causes a body to get stretched. Thus, the tidal force is also known as the differential force, as well as a secondary effect of the gravitational field. In celestial mechanics, the expression tidal force can refer to a situation in which a body or material (for example, tidal water) is mainly under the gravitational influence of a second body (for example, the Earth), but is also perturbed by the gravitational effects of a third body (for example, the Moon). The perturbing force is sometimes in such cases called a tidal force (for example, the perturbing force on the Moon): it is the difference between the force exerted by the third body on the second and the force exerted by the third body on the first. Figure 4: The Moon's gravity differential field at the surface of the Earth is known (along with another and weaker differential effect due to the Sun) as the Tide Generating Force. This is the primary mechanism driving tidal action, explaining two tidal equipotential bulges, and accounting for two high tides per day. 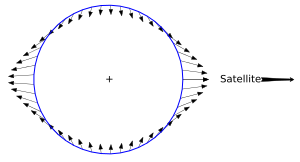 In this figure, the Earth is the central blue circle while the Moon is far off to the right. The outward direction of the arrows on the right and left indicates that where the Moon is overhead (or at the nadir) its perturbing force opposes that between the earth and ocean. When a body (body 1) is acted on by the gravity of another body (body 2), the field can vary significantly on body 1 between the side of the body facing body 2 and the side facing away from body 2. Figure 4 shows the differential force of gravity on a spherical body (body 1) exerted by another body (body 2). These so-called tidal forces cause strains on both bodies and may distort them or even, in extreme cases, break one or the other apart. The Roche limit is the distance from a planet at which tidal effects would cause an object to disintegrate because the differential force of gravity from the planet overcomes the attraction of the parts of the object for one another. These strains would not occur if the gravitational field were uniform, because a uniform field only causes the entire body to accelerate together in the same direction and at the same rate. The relationship of an astronomical body's size, to its distance from another body, strongly influences the magnitude of tidal force. The tidal force acting on an astronomical body, such as the Earth, is directly proportional to the diameter of that astronomical body and inversely proportional to the cube of the distance from another body producing a gravitational attraction, such as the Moon or the Sun. Tidal action on bath tubs, swimming pools, lakes, and other small bodies of water is negligible. Figure 3 is a graph showing how gravitational force declines with distance. In this graph, the attractive force decreases in proportion to the square of the distance, while the slope relative to value decreases in direct proportion to the distance. This is why the gradient or tidal force at any point is inversely proportional to the cube of the distance. The tidal force corresponds to the difference in Y between two points on the graph, with one point on the near side of the body, and the other point on the far side. The tidal force becomes larger, when the two points are either farther apart, or when they are more to the left on the graph, meaning closer to the attracting body. For example, the Moon produces a greater tidal force on the Earth than the Sun, even though the Sun exerts a greater gravitational attraction on the Earth than the Moon, because the gradient is less. The Moon produces a greater tidal force on the Earth, than the tidal force of the Earth on the Moon. The distance is the same, but the diameter of the Earth is greater than the diameter of the Moon, resulting in a greater tidal force. What matters is not the total gravitational attraction on a body, but the difference from one side to the other. The greater the diameter of the body, the more difference there will be from one side to the other. Gravitational attraction is inversely proportional to the square of the distance from the source. The attraction will be stronger on the side of a body facing the source, and weaker on the side away from the source. The tidal force is proportional to the difference. As expected, the table below shows that the distance from the Moon to the Earth, is the same as the distance from the Earth to the Moon. The Earth is 81 times more massive than the Moon but has roughly 4 times its radius. As a result, at the same distance, the tidal force per unit mass of the Earth on the Moon is about 20 times stronger than that of the Moon on the Earth. Thus the Earth was able to lock the Moon's rotation to its orbit around the Earth but not vice versa. Figure 5: Saturn's rings are inside the orbits of its principal moons. Tidal forces oppose gravitational coalescence of the material in the rings to form moons. In the case of an infinitesimally small elastic sphere, the effect of a tidal force is to distort the shape of the body without any change in volume. The sphere becomes an ellipsoid with two bulges, pointing towards and away from the other body. Larger objects distort into an ovoid, and are slightly compressed, which is what happens to the Earth's oceans under the action of the Moon. The Earth and Moon rotate about their common center of mass or barycenter, and their gravitational attraction provides the centripetal force necessary to maintain this motion. To an observer on the Earth, very close to this barycenter, the situation is one of the Earth as body 1 acted upon by the gravity of the Moon as body 2. All parts of the Earth are subject to the Moon's gravitational forces, causing the water in the oceans to redistribute, forming bulges on the sides near the Moon and far from the Moon. When a body rotates while subject to tidal forces, internal friction results in the gradual dissipation of its rotational kinetic energy as heat. In the case for the Earth, and Earth's Moon, the loss of rotational kinetic energy results in a gain of about 2 milliseconds per century. If the body is close enough to its primary, this can result in a rotation which is tidally locked to the orbital motion, as in the case of the Earth's moon. Tidal heating produces dramatic volcanic effects on Jupiter's moon Io. Stresses caused by tidal forces also cause a regular monthly pattern of moonquakes on Earth's Moon. Tidal forces contribute to ocean currents, which moderate global temperatures by transporting heat energy toward the poles. It has been suggested that in addition to other factors, harmonic beat variations in tidal forcing may contribute to climate changes. However, no strong link has been found to date. Tidal effects become particularly pronounced near small bodies of high mass, such as neutron stars or black holes, where they are responsible for the "spaghettification" of infalling matter. Tidal forces create the oceanic tide of Earth's oceans, where the attracting bodies are the Moon and, to a lesser extent, the Sun. Tidal forces are also responsible for tidal locking, tidal acceleration, and tidal heating. Tides may also induce seismicity. By generating conducting fluids within the interior of the Earth, tidal forces also affect the Earth's magnetic field. Figure 1: Comet Shoemaker-Levy 9 in 1994 after breaking up under the influence of Jupiter's tidal forces during a previous pass in 1992. Figure 2: This simulation shows a star getting torn apart by the gravitational tides of a supermassive black hole. Figure 6: Tidal force is responsible for the merge of galactic pair MRK 1034. Tidal acceleration does not require rotation or orbiting bodies; for example, the body may be freefalling in a straight line under the influence of a gravitational field while still being influenced by (changing) tidal acceleration. is a unit vector pointing from the body M to the body m (here, acceleration from m towards M has negative sign). is directed outwards from to the center of m (where ∆r is zero). in linear approximation as in Figure 4. The tidal accelerations at the surfaces of planets in the Solar System are generally very small. For example, the lunar tidal acceleration at the Earth's surface along the Moon-Earth axis is about 1.1 × 10−7 g, while the solar tidal acceleration at the Earth's surface along the Sun-Earth axis is about 0.52 × 10−7 g, where g is the gravitational acceleration at the Earth's surface. Hence the tide-raising force (acceleration) due to the Sun is about 45% of that due to the Moon. The solar tidal acceleration at the Earth's surface was first given by Newton in the Principia. ^ "On the tidal force", I. N. Avsiuk, in "Soviet Astronomy Letters", vol. 3 (1977), pp. 96–99. ^ See p. 509 in "Astronomy: a physical perspective", M. L. Kutner (2003). ^ R Penrose (1999). The Emperor's New Mind: Concerning Computers, Minds, and the Laws of Physics. Oxford University Press. p. 264. ISBN 978-0-19-286198-6. ^ a b Thérèse Encrenaz; J -P Bibring; M Blanc (2003). The Solar System. Springer. p. 16. ISBN 978-3-540-00241-3. ^ a b "The Tidal Force | Neil deGrasse Tyson". www.haydenplanetarium.org. Retrieved 2016-10-10. ^ a b Sawicki, Mikolaj (1999). "Myths about gravity and tides". The Physics Teacher. 37 (7): 438–441. CiteSeerX 10.1.1.695.8981. doi:10.1119/1.880345. ISSN 0031-921X. ^ R. S. MacKay; J. D. Meiss (1987). Hamiltonian Dynamical Systems: A Reprint Selection. CRC Press. p. 36. ISBN 978-0-85274-205-1. ^ Rollin A Harris (1920). The Encyclopedia Americana: A Library of Universal Knowledge. 26. Encyclopedia Americana Corp. pp. 611–617. ^ "Millennial Climate Variability: Is There a Tidal Connection?". doi:10.1175/1520-0442(2002)015<0370:MCVITA>2.0.CO;2. ^ "Hungry for Power in Space". New Scientist. 123: 52. 23 September 1989. Retrieved 14 March 2016. ^ "Inseparable galactic twins". ESA/Hubble Picture of the Week. Retrieved 12 July 2013. ^ Newton, Isaac (1729). The mathematical principles of natural philosophy. 2. p. 307. ISBN 978-0-11-772880-6. , Book 3, Proposition 36, Page 307 Newton put the force to depress the sea at places 90 degrees distant from the Sun at "1 to 38604600" (in terms of g), and wrote that the force to raise the sea along the Sun-Earth axis is "twice as great" (i.e., 2 to 38604600) which comes to about 0.52 × 10−7 g as expressed in the text. Gray, Meghan; Merrifield, Michael. "Tidal Forces". Sixty Symbols. Brady Haran for the University of Nottingham. Pau Amaro Seoane. "Stellar collisions: Tidal disruption of a star by a massive black hole". Retrieved 2018-12-28.